Because every single person alive has an Inner Compass! Every person has his or her own unique, personal, internal guidance system – which is working at all times and which is each person's direct connection to the Great Universal Intelligence that created each of us and all of Life. That's what Barbara’s new book is about. The book is about how to find, understand and use your internal guidance system, which Barbara calls the "Inner Compass"– to live a happier, more fulfilling, exciting and wonderful life. The book is based on the understanding that this "Inner Compass" is, in every moment, giving us precise information as to what is the best way forward for each of us. And how does the Inner Compass do this? It does so by means of our emotions. In the book, Barbara explains the true significance of our emotions and how they are indicators of whether or not we are in alignment with the Great Universal Intelligence that has created all of us. 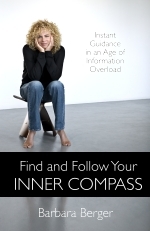 Find and Follow Your Inner Compass has just been released in English by O-Books in the US and the UK. Click here to order the book. The book is already out in Danish, Czech and Polish and will soon be released in Portuguese (Brazil). We will let you know when we have a release date for the book in the many other languages Barbara is published in. You can read more about Find and Follow Your Inner Compass in this article that Barbara just wrote for Kindred Spirit magazine. Or check out this short article that Barbara wrote for Inner Self magazine where she describes some of the main points in her new book. We call it "How to Find and Follow Your Inner Compass in 3 minutes"! You can read this short version here. Click here to hear more radio interviews with Barbara about her new book. "This 105 page warrior is the complete package. The author told me with her wit, examples and compassion how to listen to me, to find the small still voice and to follow it no matter what. I do believe many of us were taught to put others feelings and needs before our own, and it is wonderful to have my new little buddy tell me to just listen and follow my heart. I would recommend this simple slice of Heaven to anyone wanting the bottom line to self love. Thanks Barbara, it makes so much sense." "This is a fantastic book! If you are willing to work with it, your life will flow freely, and you will experience anything that you have the ability to envision! Definitely a resource book for personal growth!" Read the full review here. "Berger is a big name in the field of personal development with a large following. 'Find and Follow Your Inner Compass' definitely lives up to her other books. The book is easy to read and use and every library should buy it and have it in stock." "Everyone has an Inner Compass, but not everyone knows how to use it. Barbara Berger can help with this. In her beautiful new book, she guides you in how to experience a life with more flow and joy – by using your Inner Compass. And it's interesting reading indeed – because we all know about the dilemmas she describes. Strongly recommended!" "In her new book, Barbara Berger shows us how one can live a happy, abundant and fulfilling life in an increasingly turbulent world. According to Barbara Berger, the key is to pay attention to our feelings and live in harmony with who we really are. A simple recipe – not unlike what the Greek philosopher Epictetus said." "I recommend that everyone – no matter how difficult it may seem – follow Barbara Berger's book on the' Inner Compass'. If I hadn't done so, I wouldn't be sitting here today, telling my story. Because understanding the 'Inner Compass' is the key to living a true and authentic life. Oh how easily we get off track. Thanks for everything, Barbara!" "Following the simple approach in Barbara Berger's book – 'Find and Follow Your Inner Compass' – can totally revolutionize your life. I know because it has revolutionized mine."